We visited for a Sound Bath. We drive out of town. Past adobe houses and Airstreams, solar panels and prickly pear, Joshua trees, roadrunners and desert scrub. It’s 3pm on January 2nd and the light is thinning. We crunch into the car park where a Mayan calendar hangs from a tree, spinning in slow circles. Even in the car we can feel it. It’s the peso electricity, our guide Drayton says later. There are geomagnetic properties in the ground, he says, and three rivers coming into one. Nine laylines intersecting. Seventeen cracks in the giant rock. We’re at the Integratron – 25 minutes from Joshua Tree in the Mojave Desert – to do a sound bath. In 1953, aircraft engineer George van Tassel was meditating at a sacred American Indian site called Giant Rock when he was apparently visited by a UFO laden with aliens from Venus who told him how to rejuvenate human cells. Acting on their instructions, he spent 18 years building the Integratron: a “device” to enable rejuvenation, anti-gravity and time-travel. 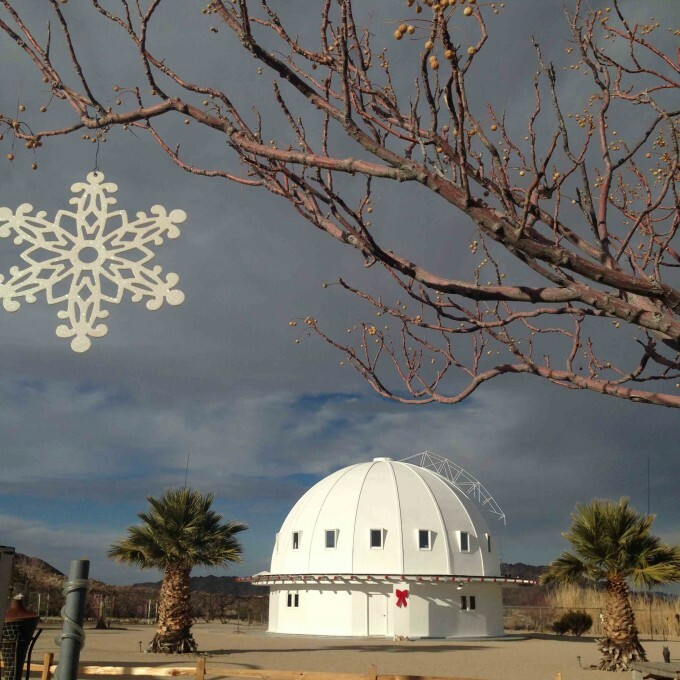 Now owned by three sisters, the geodesic dome glows white amid the dusky pinks of the high desert plains. Signs point us to a smaller dome/gift shop. We paw over merch for a while but the acoustics amplify every sound ten-fold and it freaks us out. “Take a drink from the well, sit by the fire,” the dome guy suggests. In the courtyard, logs smoulder in a pit and soul music plays. My partner swings in a hammock. I light a hunk of palo santo wood, drink some well water and cultivate a brief interest in seed-saving techniques, flipping through a book I found in the ladies. Fellow sound-bathers arrive. Los Angeles hipsters, mainly – guys wearing bomber jackets and girls in vegan leather leggings. Some military folk. A man with a service dog. It is time. Inside, the Integratron is all ruddy wood trapping the last of the day’s sun. It smells delicious. Here, apparently, magnetometers register a spike in the earth’s magnetic field. Our guide, Drayton, ushers us up a ladder into a circular loft with 360-degree desert views. 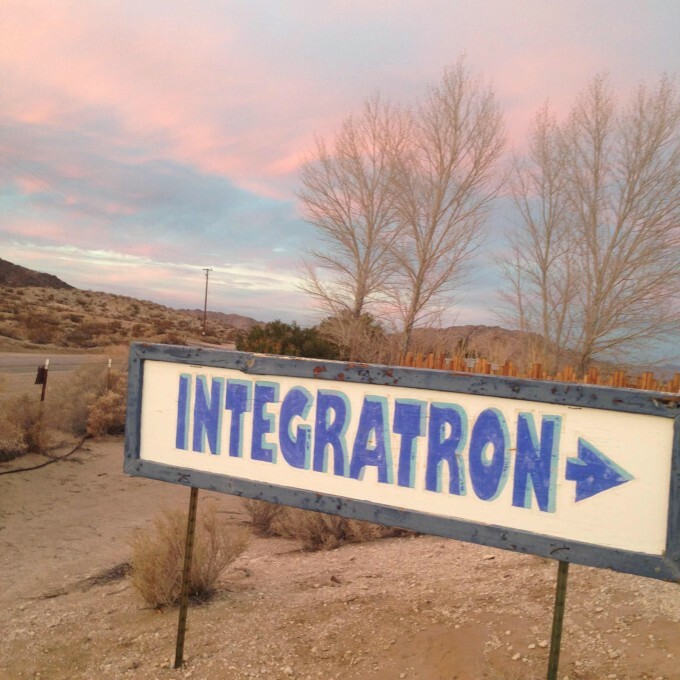 The Integratron is known as an “acoustically perfect” space. Shipbuilders were recruited to craft its ribbed wooden vault. I feel like I’m in the body of a giant guitar, or a hollowed-out piano. We recline on mats and Drayton follows us up. “Did you stand in the middle of the dome and make joyful noise?” Why no, Drayton, I did not. He lays down the law on snoring. Due to the wood’s curvature even the slightest rustle from the person directly opposite you – also the person furthest away – gets right up in your earhole. Please rouse snorers, Drayton says, so as not to create a “daymare” for those opposite. With that, he starts rubbing the rim of the first of 20 quartz crystal bowls. It’s a feast of pure vibration. The bowls resonate in ‘G’ – the fifth chakra, the throat chakra. “You’re inside an ancient time travel machine.” Resistance is futile. My mind loosens. When it’s over, Drayton puts on a CD by Stars Of The Lid. After the formlessness of the sound bath, even Stars Of The Lid’s celestial ambience is painfully resolute. People are beginning to rouse, groggily. I hang on to my half-state, stare at wood grain of the window ledge and appreciate its beauty. Someone speaks. Sound has sharpened into words: it is over. The verdict? In his 1959 novel Sirens Of Titan, Kurt Vonnegut writes about paper-thin creatures that cling to cave walls feeding off Mercury’s vibrations. They are perfectly happy beings called harmoniums and in the Integratron I understood their vibrational diet. Joshua Tree is less than two hours from Los Angeles and has a bunch of cheap motels with cool neon signs. Even better, stay in one of the great Airbnb options like this ‘Zen Dome’ or this hobbit hole-inspired ‘Sleep Pod’. 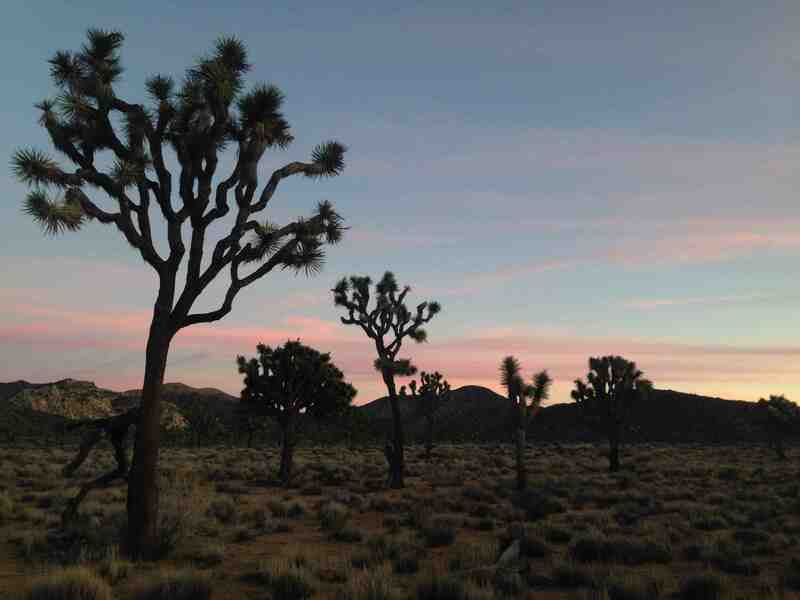 Vintage clothes are Joshua Tree’s speciality – Ricochet Vintage Wears was my favourite. (Ask the owner about her camels.) 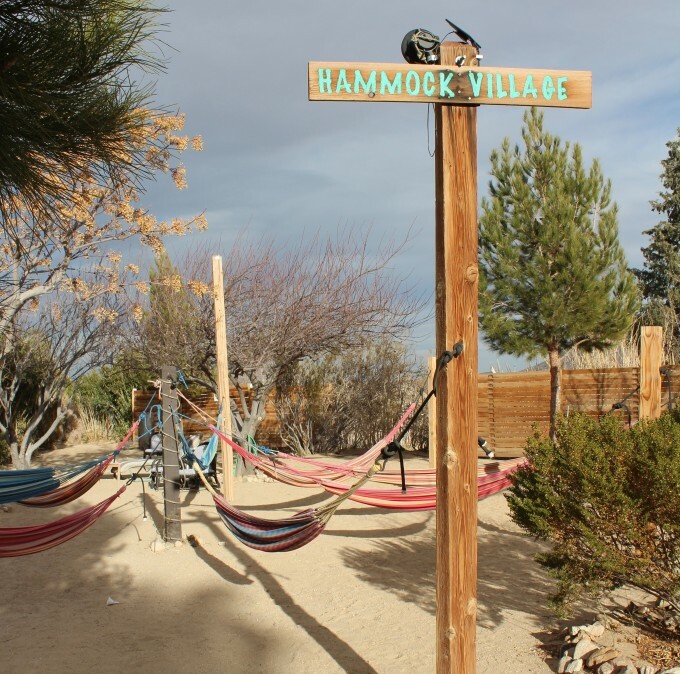 There are markets on the weekends, some great thrift stores and the famous Joshua Tree Saloon. Pony up to the bar for a pint of Fat Tire or Lagunitas, eat a burger in a booth, or sing karaoke. Twenty minutes away, in Pioneertown, Pappy and Harriet’s is a live music institution. Check out Qantas flights to LA below.